I’ve been mildly addicted to watching YouTube makeup gurus lately, and it’s fun to see what they can do with makeup! Not all of it translates directly into ballroom makeup, which tends to be way more dramatic and verging on drag-queen level than even the most smoky party makeup, but there are a lot of great ideas and inspiration for incorporating into your competition or showcase makeup routine. And, they show a lot of great techniques and tricks. My current favorite look is a cut crease, so I will endeavor to try that at my next comp. Maybe with some vampy lips if I’m feeling sassy. I’ve also included beauty tutorials from ladies of different ethnicities, since I’ve noticed that there is not a huge amount of diversity in ballroom-specific makeup videos. Bonus video! (Has nothing to do with ballroom makeup inspiration.) What the crap. This girl is a-maz-ing. I think I’ve gotten competition makeup down to maybe 15 minutes if I’m in a real hurry and everything is cooperating, but this takes mad skillz – check out how well she does that eyeliner wing in literally 3 seconds. Also how quickly she puts on fake eyelashes! Not to mention the rest of her videos, especially some of the crazy Halloween ideas. Success is all about your mindset. The struggle is just in your head. Mindset matters. These are all variants on a cliché we’ve heard plenty of times, probably a lot in sports especially. But this is one of those cases in which the cliché reflects the truth, at least when it comes to one particular distinction between two types of mindsets: fixed mindsets versus growth mindsets. This distinction was found by Carol Dweck and her colleagues, and dozens and dozens of correlational studies and experiments have found evidence that mindset matters. Dweck’s book. Haven’t read it personally, but I’ve heard it’s good. Basically, a fixed mindset is the idea that each person has a fixed trait that determines their ability. This most often applies to intelligence, but it can be about any skill – so this is the idea that we each have innate talents that determine how good we are at a given activity. Most people think of IQ this way, as something we are born with that cannot be changed, no matter how hard we try. On the flip side, growth mindsets are the idea that we can improve our abilities over time with practice, dedication, and hard work, and that we are not limited by innate talents but instead can nurture them over time. Going with our IQ example, this would be the idea that we can change someone’s IQ with things like education, nutrition, or other environmental factors. Interestingly, fixed mindsets are tied to performance goals, in other words, trying to demonstrate your ability either to yourself or others, while growth mindsets focus more on improvement and learning, honing that ability over time. Growth mindsets tend to be better for people both in the short and long term, particularly when they are not very skilled at something to begin with. Why? Because if you have a fixed mindset and fail, you are more likely to give up because you think, “I’ll never be better at this.” On the other hand, if you have a growth mindset and fail, you are more likely to think about how you can improve and do better next time. Fixed mindsets for people who initially succeed are nice and all (probably ego-boosting, in fact), but the key difference lies in when people fail, which they inevitably will at some point. People tend to lean towards having a more fixed or growth mindset as a default, at least when it comes to specific domains such as intelligence or sports performance or just about anything. 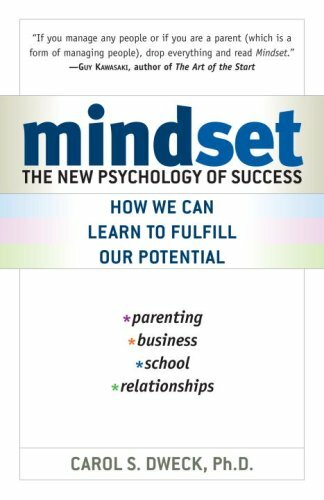 However, research has also shown that mindsets can be manipulated – if we learn about benefits of growth versus fixed mindsets, then people can shift their perspectives and benefit from the good things that come with growth mindsets. Why am I telling you all of this? Well, I think it’s inherently really interesting and challenges a lot of people’s naïve theories on how people work, but it’s also super relevant to ballroom dancing. Some people have the idea that they’ll wander in to a class, take a lesson or two, and immediately be able to dance, but us ballroom dancers know it’s not remotely that easy. I would say it takes a year of regular instruction for most people to feel really comfortable with a full repertoire of ballroom styles, and of course many, many more to master them. For some people, particularly those with a lot of previous dancers (you know who you are, having danced ballet/jazz/tap/etc. basically since being able to walk), ballroom comes very naturally and without much effort or struggle. Sure, you have to correct a few habits, but learning steps is extremely easy. For others, ballroom is fun but much more of a challenge! The pesky alignment thing in standard, learning the difference between all the subtypes of styles, simply remembering what foot goes where. Feeling like a total clod and thinking that it’s near impossible. I was there, back in the day. I had no idea what was happening half of the time, but it was still fun and after a while of mucking around, I realized I would have to put effort, money, and a lot of practice time into learning these skills. Having a growth mindset is really much more conducive to learning and improving, compared to a fixed mindset. Yes, _______ is hard, but once you get it, it’s all that much more rewarding. I do have one caveat – I do think most of us have some innate ability to learn particular skills. There’s no denying that some people are more “natural” at things than others. In dance, some people are more flexible or have a more ideal body shape for a particular style or learn steps faster than others do. However, each of us can make the most of what we have, and sometimes being not so natural at something can produce passion and drive to improve that many of the “naturals” lack. Anecdotally, one of my friends was better at standard than Latin when he started, placing quite well at competitions in standard. But he decided, I want to be a Latin dancer. That’s what he really enjoyed and aspired to be, so he worked hard at it over time, practiced a lot, and got to be a pretty good Latin dancer. If he had had more of a fixed mindset, thinking he couldn’t get much better at Latin, he might have just stuck to standard or maybe even given up dancing at all. Every time we advertise the club in effort to recruit new members, I inevitably encounter the same sorts of reasons to not join. “I have two left feet,” “I don’t know how to dance,” “I could never dance like that,” and so on. Very fixed mindset, wouldn’t you say? Hey, that’s where I and 95% of the people in the club started! People have this idea that ballroom dancing’s some magical power that we just have, but we all start as beginners. For those who have been dancing some time and can’t imagine ever reaching some level, be patient with yourself. People tell me, “I could never be as good as you!” Not true. A few years ago, I never would’ve imagined myself competing at pre-champ or champ levels, but here I am (at least, in some styles). It took quite a few years, but it happened. So, if you ever feel like “ugh, I could never do that,” check yourself and remember that with enough hard work and dedication, you totally could. Just keep chugging along. I guess I’m technically a day late, but Merry Christmas and Happy Holidays to all, whatever you celebrate! And if you don’t, I hope you enjoyed a day or two or more off to relax. My family did the whole present thing, then had a Vietnamese duck soup lunch (this restaurant was crowded!) and surf and turf dinner. Super traditional, I know. Here are a couple of holiday themed showdances for your enjoyment/entertainment. I promise that part of the second one is hilarious…starting a little after minute 2. I’ve seen three pretty good dance documentaries recently – two are about ballroom dancers, one was on ballet. For dancers, you get a glimpse into elite dance life and a fair amount of inspiration from the dance scenes themselves. For non-dancers, some parts may be more or less compelling, but these films still provide great insight into an unfamiliar, beautiful world of dance, revealing how much hard work gets put into this art form. Either way, they’re worth a watch! This new coming-of-age documentary aired on PBS recently as part of their POV series and is available to stream online here until August 20th, 2014. (If you are not in the US you can purchase it on iTunes.) The star is 15-year-old Egor, a Russian teen who has moved to the foreign country of Denmark for a partnership and elite Latin dance training. His mother is thousands of miles away in China and they rarely get to see each other, but Skype often. Fourteen-year-old Mie is his partner and new “sister”; Egor now lives with her and her family. The film follows them through the newish stages of their partnership, practicing, and attending a few big dancesport competitions. But the focus does really seem to be Egor’s adjustment to a new country with different norms and culture while being away from family. It’s also a character study into a quiet perfectionist with an intense drive and passion for what he does. He isn’t comfortable sharing his feelings with others, which contributes to some frustrations. I’m not sure how interesting this documentary would be for non-dancers, but it was pretty enjoyable to me. Also by Danish directors, this documentary focuses on the famous Slavik Kryklyvyy’s attempt at a comeback with partner and girlfriend Anna Melnikova in the professional Latin division. He’s said by some to be the best male Latin dancer today. If you have kept up at all with these two, you know how the story ends already (more or less), but the journey is still compelling. Slavik is an unrelenting perfectionist. He’s tempestuous and demanding of Anna (an amateur world champion in her own right) in his pursuit of a professional Latin world championship – a title owned by his former amateur partner, Joanna Leunis. This film is full of interpersonal drama, but is also an intimate portrait of dancers, athletes, and artists in pursuit of being the best. Sometimes they talk a lot, other times everything is communicated through facial expressions and body language in silence. The studio rehearsal scene for their “Always On My Mind” rumba showcase is fantastic – moving, raw, intimate. I think it’s even better than the actual performance. You can watch the movie here. It used to be on iTunes but has apparently disappeared. And now for something different! Ballet! First Position follows six young dancers (aged 10-18-ish) on their journey to the Youth American Grand Prix, a major international event that leads to apprenticeships, scholarships, and coveted jobs for young ballet dancers. This is where all the major ballet companies can see them and where talent can be discovered. We meet dancers from all sorts of backgrounds, but it’s clear that they have several things in common – dedication, passion, hard work, and unrelenting willingness to sacrifice. Their families must often do the same to support their children. Joan lives in the US, far away from his family in Colombia. Aran’s family commutes hours to his studio. Miko’s family decided to homeschool her so she would have more time from dance. Michaela was adopted from war-torn Sierra Leone, is one of few Black ballet dancers, and has to deal with an injury as the competition looms near. Each of the featured dancers has truly amazing skills, often surpassing those of the dancers you would typically see on So You Think You Can Dance. What’s nice is you see that while these dancers are amazing, there are some struggles – occasionally they do mess up, which can be very noticeable in the super-precise, technical dance form of ballet. Again, common in these three documentaries, is the strive for perfection. It is also striking how many of these kids know what they want to do for the rest of their lives at such an early age, while many of the rest of us have no clue. Naturally, you can expect lots of really beautiful dancing in this film! What’s nice is how they show other competitors, dancers, and parents as well, carving out a more complete depiction of this competitive ballet world.